Kristin Kirkner | Kirkner Family Law Group, P.A. Shared parenting can be difficult without an effective Timesharing Schedule. Timesharing schedules, or more commonly called child custody schedules, can be challenging and time consuming to develop. The schedule and exchanges must consider the communication between the parents, as well as the work schedules of each parent and the child’s school and extracurricular activities. When I work with clients to develop a timesharing schedule, it sometimes helps to have examples of what other families have done so that we can use that as a starting point to develop a specific timesharing schedule to meet the needs of each individual client and their family. I found the following article to be very thorough and it gives a great summation of each of the various options for timesharing. What kind of custody schedule works best for a shared parenting plan? Well, the best custody schedule is one that will give both parents sufficient time to continue to nurture and develop their relationship with the child. There are many schedules that parents can choose that will allow them to do this, so a mother and father need to assess their situation and think about what will work for them and the child. 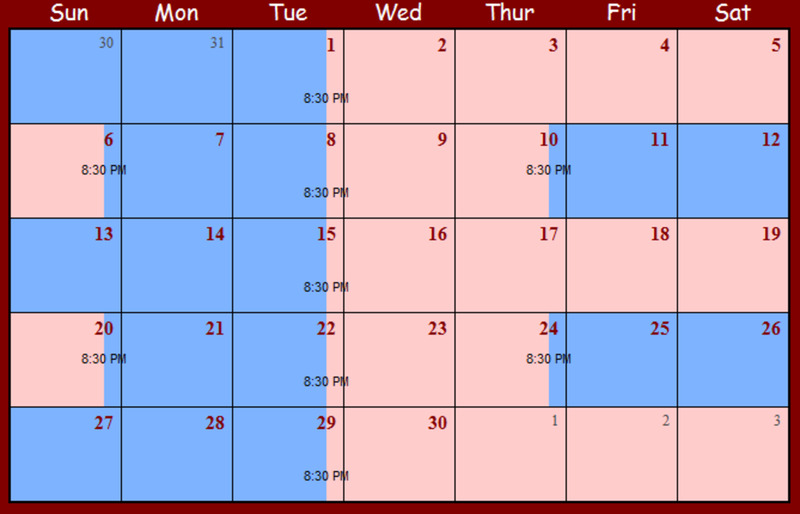 Here are somesample child custody schedules that parents use in their shared parenting plans. You can choose any of these schedules for your plan, or you can modify and adapt them to meet your needs. For a shared parenting plan, most parents don’t think that the common weekend schedule (where one parent has the children every weekend or every other weekend) will work. However, many parents find that they can modify a weekend schedule so that the parent has additional time. Weekend schedules work well for children who are very involved in school during the week and when the parents don’t live very close to each other. A common variation on the weekend schedule is to add evening or overnight visits during the week. So, a parent may have the children every other weekend, but also has an overnight visit every Wednesday. Or the parent has the children every weekend along with two evening visits during the week. Parents can add visits and time as it works for both parents and the children. Another variation on the weekend schedule is to extend the weekends. This depends on the work and school schedules involved, but the weekend could start on Thursday evening or extend until Monday evening. This gives the parent more time. Many parents who want equal time with the children find that splitting the weeks in half work well. Common custody schedules for this arrangement are the 2/2/5/5 and 3/3/4/4 schedule. In these schedules, Parent A has the children for two or three days, Parent B has the children for two or three days, Parent A has the children for five or four days, and Parent B has the children for five or four days. Then the cycle repeats. This schedule ends up consistently splitting the week in half–as you can see in the picture. A common schedule for a shared parenting plan is when parents alternate weeks of custody. A mother and father can also adjust this schedule to meet their needs by adding evening and weekend visits to the parent who doesn’t have custody that week. When children have a rigid school schedule, or when parents do not live close to each other, they may need to be creative about how the parent will still have contact with the children. Parents can choose to have one custody schedule during the school year and then change it during vacations or school breaks to give the other parent more time. Parents can also have contact with the children through webcams, telephone, texting, email, instant messaging, etc. Should you need assistance with a shared parenting Child Custody Schedule please call our office today. (813) 254-0156 or fill out the form below.